From the back cover: If you’re curious — but hesitant — to start using Microsoft’s newest enterprise operating system, then this is the book for you! 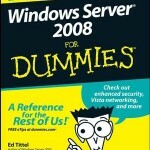 Within this friendly reference, you’ll find everything you need to know about Windows Server 2008. From installation and deployment to building and running a Windows Server 2008–based network, you’ll gain the knowledge you need to use Windows Server 2008 immediately.